in may 1977, the 30th World Health Assembly adopted a resolution in which it decided that by the year 2000, all citizens of the world would attain a level of health that will permit them to lead a socially and economically productive life. This came to be known as "health for all by the year 2000". The year 2000 has arrived and predictably the Union government has failed to meet the target. At a press conference held recently, the Union minister of health, C P Thakur, said the "national health policy would be revised and health for all would be a reality by 2010." He added that "the change in health scenario, epidemiological situation of communicable and non-communicable diseases and liberalisation of economy had necessitated revision of the policy that was first drafted in 1983." However, some disagree and say that even this deadline cannot be met. "Health has been politicised and economic issues are being placed above health.At this rate we won't achieve health for all even by the year 3000," says Prem Aggarwal, general secretary, Indian Medical Association. Agrees Mira Shiva, head, policy research, Voluntary Health Association of India. "It would be difficult to achieve the target even by 2010, because now we have the wave of globalisation to encounter. Only if there is a dramatic change in policy, not only at the Government of India level but also at the level of World Health Organisation and World Bank, can we expect something," she says. Even if the new minister has his best intentions, in this age of globalisation and the changing mindsets of people who are taking decisions, granting money at the world level must occur to achieve something, she says. "Moreover, we have to remember that the changes in health sector cannot improve, if we don't change our policies in allied sectors like food subsidy and cropping pattern," adds Shiva. India's maternal death toll is the highest in the world. 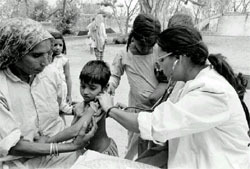 Seventy per cent of births take place in rural areas where there is little trained medical assistance. "The primary healthcare system has not kept pace with developments outside due to inadequacy of government resources and also a shortage of medical staff. There has been a severe commercialisation of medical care," says Shiva. Elaborating on the relation between foreign funds and our policies, she says, that the loans are now deciding our policies instead of our immediate needs. India ranks lowest amongst all the nations in health care, far below than Asian countries such as China and Thailand. India also has the highest sickness rate (only next to Sub-Saharan Africa), highest proportion of malnutrition, stunting and tuberculosis incidence, abysmally archaic sanitary conditions and low levels of water safety. "The government alone cannot handle health alone. There is a record that private sector is more successful. Also other countries invest a large part of their investments in the health sector. I hope this ministry will take a close look into the malaise," says Vinay Aggarwal, joint secretary, Indian Medical Association.